Home / Boracay Island / Dr. Keesh Potgieter / Duterte Janitor / Franciso Baraan IV / Manila Bay Clean-up / Pres. Rody Duterte / Viral Stories / Doctor Slams HR Advocate Who Says Pres. Duterte Should be "Janitor" Instead of Being President: "Keep your Mouth Sealed!" Doctor Slams HR Advocate Who Says Pres. Duterte Should be "Janitor" Instead of Being President: "Keep your Mouth Sealed!" A veteran doctor slammed Human Rights advocate and Duterte critic Francis Baraan IV for criticizing the efforts of the Duterte administration in cleaning the world's famous island, Boracay and the Manila Bay. The veteran doctor was identified as Keesh Potgieter who reacted on the controversial post of Baraan on social media. 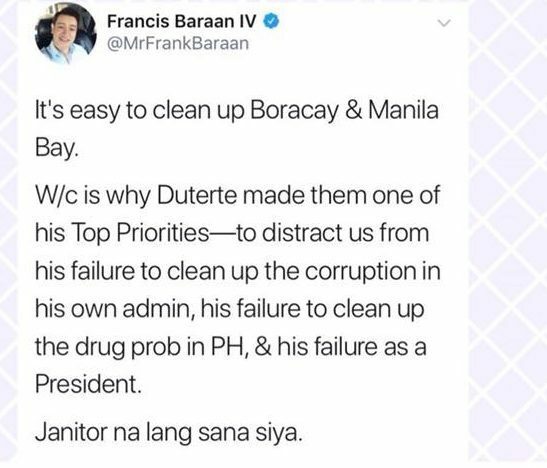 Baraan's post on social media raised the eyebrows of Duterte supporters after he said that the President is only fit to become a "Janitor" than being the Chief Executive of the Philippines because of his priorities. Baraan stated that Pres. Duterte only used Boracay Island and Manila Bay rehabilitation to cover his failures in addressing the other more pressing issues being faced by the country today. Francisco Baraan tweeted the following: "It’s easy to clean up Boracay & Manila Bay. W/c is why Duterte made them one of his Top Priorities – to distract us from his failure to clean up the corruption in his own admin, his failure to clean up the dr*g prob in PH, & his failure as a President.” Baraan said in his tweet. The controversial tweet of Baraan caught the attentions of DDS netizens as they slammed the controversial Human Rights advocate. 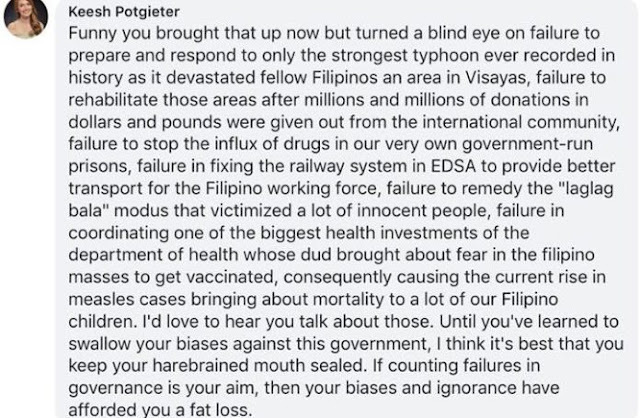 Aside from the DDS netizens, a veteran doctor, Dr. Keesh Potgieter, who expressed support on the recent project of the Duterte administration to clean up Boracay slammed Baraan on social media. According to Dr. Potgieter, Baraan should also think about the failures of the past administration who's openly supported by Baraan during the tenure of former Pres. Noynoy Aquino. In the lengthy comment, Dr. Keesh Potgieter listed the failures of the Aquino Administration and she also suggested that Baraan should "Shut his Mouth Until his Biases Against the Government is still there." 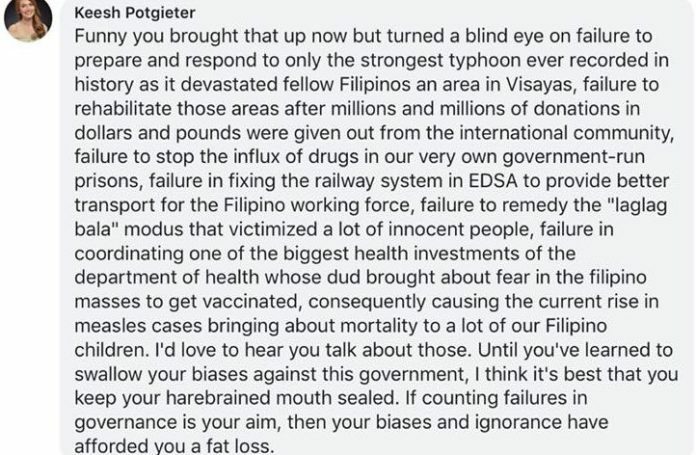 "Funny you brought that up now but turned a blind eye on failure to prepare and respond to only the strongest typhoon ever recorded in history as it devastated fellow Filipino an area in the Visayas, failure to rehabilitate those areas after millions and millions of donations in dollars and pounds were given out from the international community, failure to stop the influx of dr*gs in our very own government-run prisons, failure in fixing the railway system in EDSA to provide better transport for the Filipino working force, failure to remedy the “laglag bala” modus that victimized a lot of innocent people, failure in coordinating one of the biggest health investments of the department of health whose dud brought about fear in the Filipino masses to get vaccinated, consequently causing the current rise in measles cases bringing about mortality to a lot of our Filipino Children." "I’d love to hear you talk about those. Until you’ve learned to shallow your biases against this government, I think it’s best that you keep your harebrained mouth sealed. if counting failures in governance are your aim, then your biases and ignorance have afforded you at fat loss." The controversial issue started after Pres. Duterte successfully rehabilitated Boracay Island for six months and the successful launching of the project to rehabilitate Manila Bay.